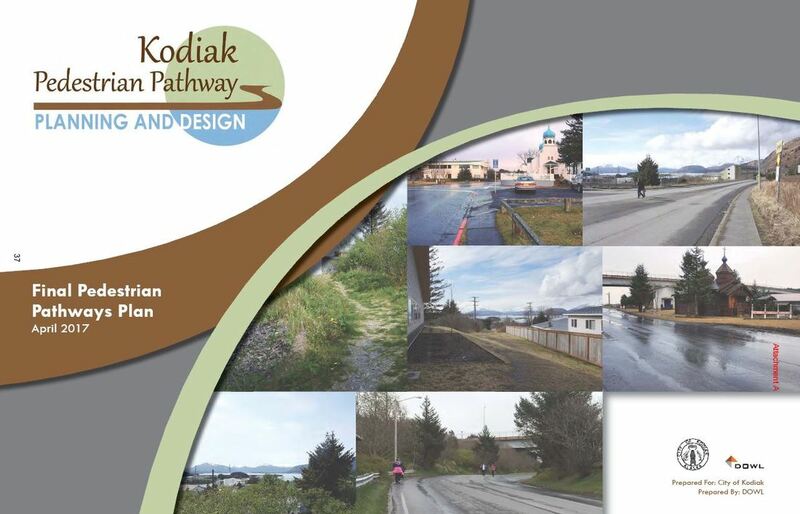 On April 27, 2017 the Kodiak City Council adopted the Pedestrian Pathway (PedPath) Plan for downtown Kodiak, which prescribes a series of ten small to medium-scale, incremental projects to improve the walkability of downtown between Center Avenue and the bridge to Near Island. You can download the complete plan here. With the long-awaited plan complete, ITN sees our role as to advocate for its implementation through cruise ship head tax revenues, city, state and federal appropriations, and grants, and to work toward the larger vision of connecting the downtown pathways to outlying neighborhoods (read on). Since 2011 ITN has been advocating for a paved, multiple-use pathway radiating outward from downtown Kodiak to include mid-town and up-town neighborhoods to the northeast of the city center, and finally to include rural communities to the south. The city of Kodiak took early steps toward making Kodiak walk-friendly by introducing sidewalks to the grid of the city streets after the rebuilding of downtown following the 1964 tsunami. In the 1980s a 2 1/2 mile bike path along Rezanof Drive was installed, and now is a flagship path connecting mid-town and up-town neighborhoods. ITN has been working with the City of Kodiak Parks & Recreation department to develop ideas for a community path that links together all the community resources including schools, parks, government buildings and civic centers. Located largely outside of road ROWs, this proposed path still manages to use existing paths and walkways and prospective routes through publicly owned green spaces to connect 33 schools, museums, civic centers and parks before linking up to the Rezanof path at Benny Benson. The community path project can minimize costs by using public lands where possible, avoiding the use of federal highway dollars and onerous construction specifications that come with them, and piggy-backs on existing infrastructure where possible. In some places the path is nothing more than a strip on a sidewalk or a sign. In other places, it will be a 10’ wide compacted gravel path with landscaping.